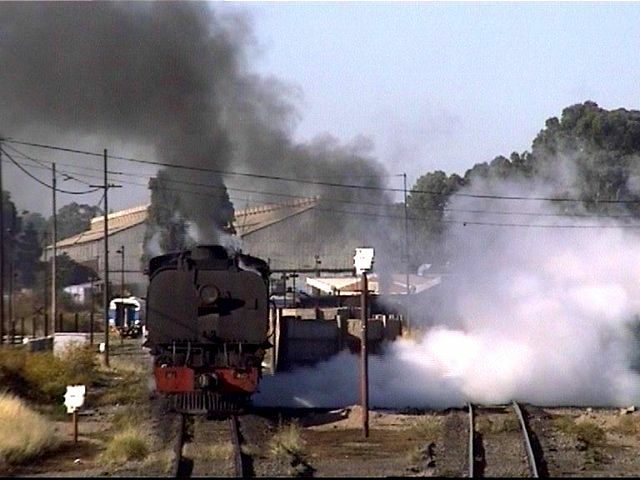 The lure of the Garratts again became too much to bear last week, so three of us from Friends of the Rail decided to smell some Garratt steam in Zimbabwe on the 16th/17th/18th April weekend. Leaving Friday afternoon, it was a dash to the border before it closed at 8:30pm, and 8:20pm saw us cleared on the Zimbabwe side. Formalities on the RSA side were started at 7:30pm, so we just had enough time. 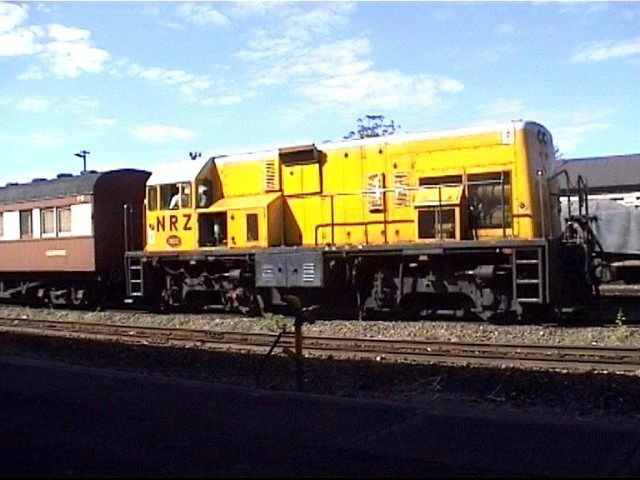 Driving north towards West Nicholson, we saw a works train in section on the new BRR (Beitbridge Bulawayo Railway) line, and the crews were busy laying sleepers and rail, with floodlights and generators set up to provide light. I gather this project is running under some tight deadlines. Bulawayo arrival at around 1:30 am. After going to bed at 2:00am, we had 3 hours of restful sleep (!) before heading down to the steam shed at 6:00 am. First stop of course was the foreman's office to declare our presence and make sure it was okay to wander around. Leaving the office, you can hear the hiss of steam, the sky dark with coal smoke, the Garratts just out of sight behind the next building. Walking through, the magic sight is there - 6 Garratts lined up, blowers on, steam leaking everywhere, hissing and smoking in the half-light before sunrise. Fitters carrying out last-minute tasks, firemen cleaning fire, throwing on coal, taking water, ash-pits being emptied, drivers having a last minute chat with the shed staff, it's a hive of activity. Then a Garratt give three pops on the whistle. The flag man walks across from his office gives the loco the green flag, and the Garratt is away, clearing its throat of condensation in thick white steam clouds. Soon it has disappeared across the turntable and off to do its day's duty. Soon afterwards, another three blasts of the whistle, and the scene repeats. 19 Unicem #1 - surprise of the day! 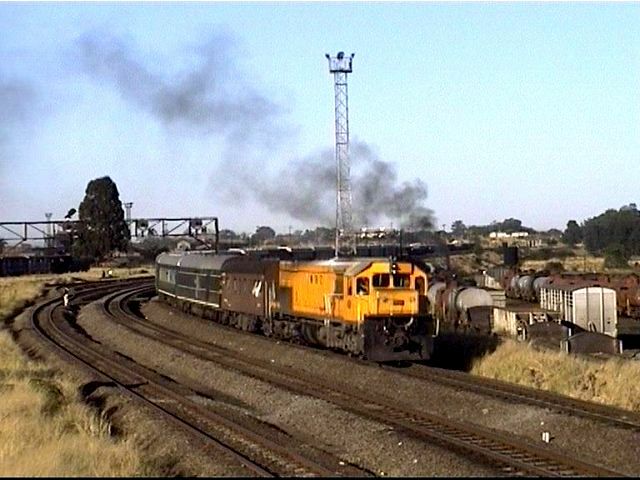 This loco was in at Bulawayo for repairs, and was supposed to go back to Cement 17/04/99. I would hate to have seen it before the repairs, as it was in terrible condition. 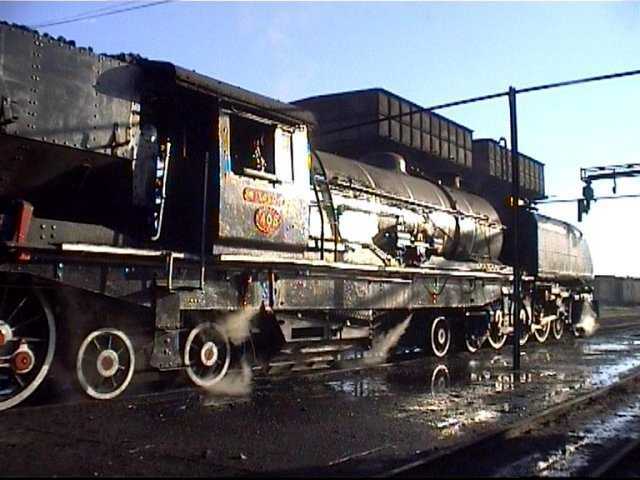 I was amazed it could keep enough steam to move itself once all the leaks had taken their share of steam! On top of that, its wheels are incredibly hollows (around 10mm by my guess) which, I suppose, prevents it from falling off the rails! 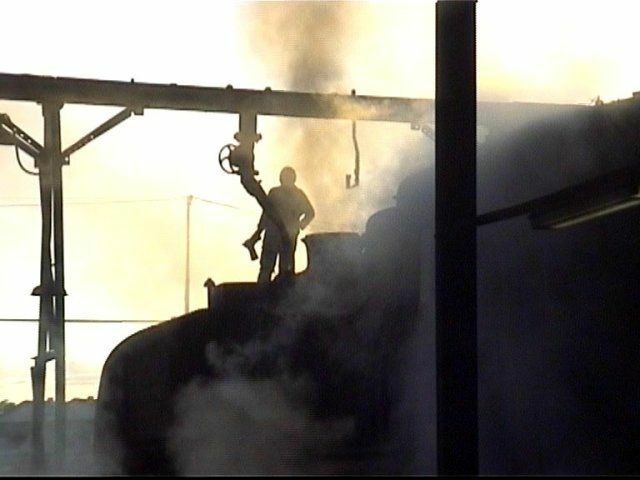 We were blessed with a clear cool morning, with lovely sun and steam, which made for some great photography and video. 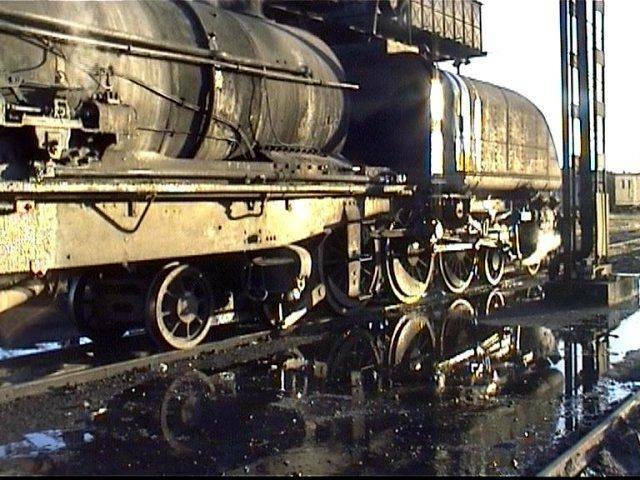 Once all the locos were off shed, we wandered towards the station. The mixed train from Chiredzi arrived behind DE10A 1009 as we were walking past, and a 15A was busy pushing a new blue train set into the station (didn't get a shot!). The station buildings have been cleaned and painted and look quite nice, the tracks however are littered with rubbish and mess, quite a contrast to a couple of years ago. 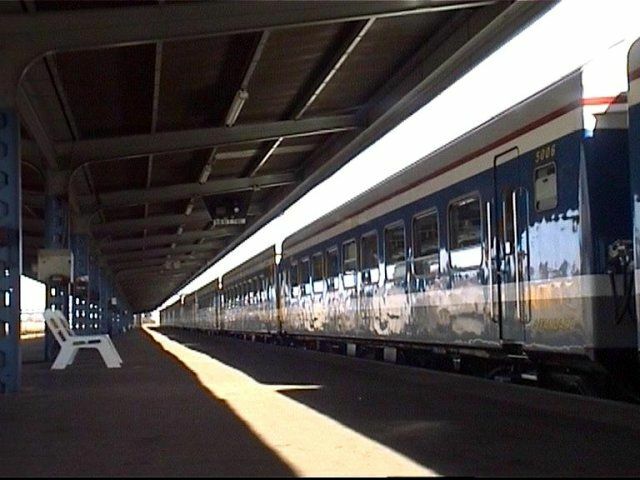 In platforms three and four were trains of the new passenger coaches, the livery is very smart. A couple of diesels have been painted in the new colors as well. After a cuppa and a scone from the kiosk, we inspected one of the new passenger consists. We quickly realised that the set was brand new, and had not yet entered service. The coaches have two classes of sitter, standard and economy. The standard class has comfortable cloth aircraft style reclining seats, stowable tray tables, and an audio-visual system. 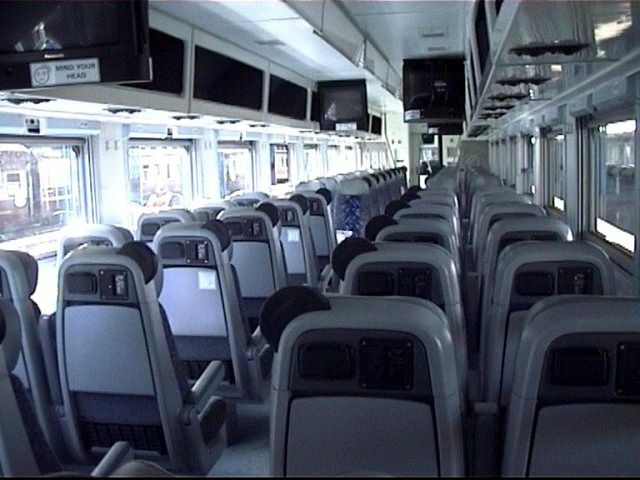 There are video screens situated in the middle of the coaches, similar to those on aircraft. The economy class is a bit less luxurious, with smaller vinyl seats, but still with the video screens. There were also a couple of sleeper coaches, whose compartments and coupes were quite plain, similar to an average MLPS sleeper compartment. This consist did not have a diner, but did have vending machines, one for beer and one for food! A South African chap from UCW (Union Carriage and Wagon) was working on the coaches, as were a number of other people. 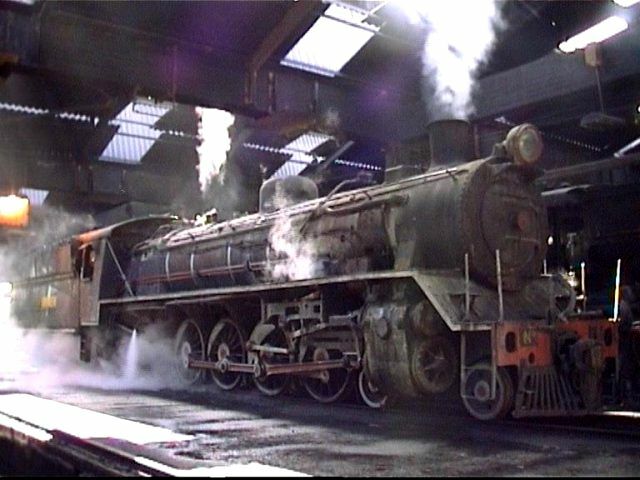 They were rectifying a number of issues that had been found with the sets that have already entered service. Apparently the fluorescent tubes fell out of some of the coaches, so extra brackets were being fitted, all the screws in the toilets and sleeper coaches were being replaced with vandal-proof screws, as most of the fittings on the coaches already in use have already been "reallocated" by passengers. A few other minor items were being attended to. 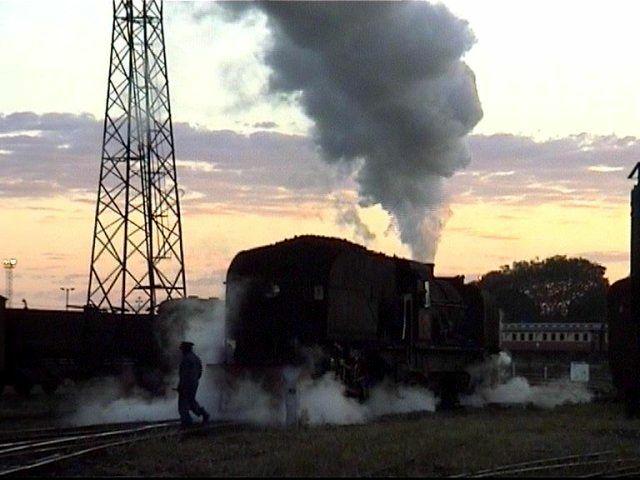 The UCW guy had been in Bulawayo for a month, he was supposed to be finished 18 April 1999. The new consists are very impressive, I think MLPS could do with a few like that. One wonders however, how long they will stay in such good condition. 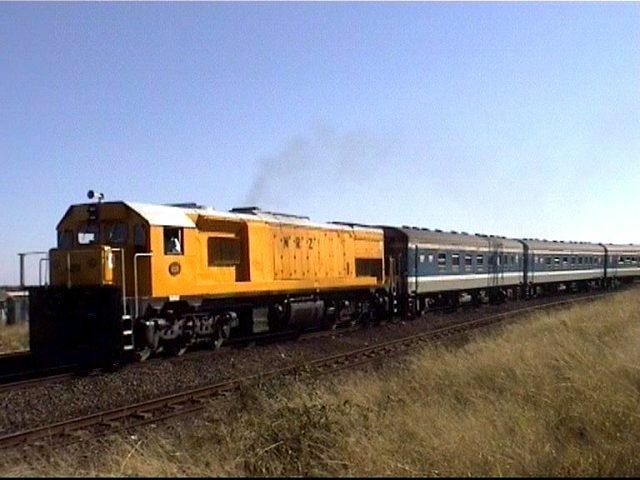 The older NRZ coaches are looking very shabby now, not having been washed for many weeks (months?) by the look of them. There are some real gems still in use though, including some lovely clerestory stock, and in the yards around the station some other fantastic old coaches are still around. 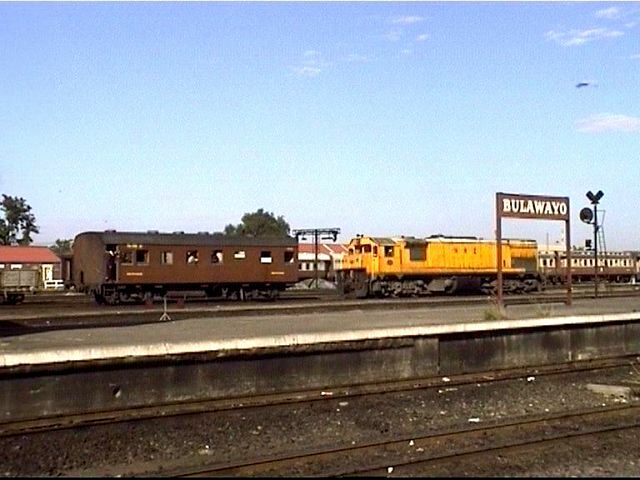 We visited the NRZ Museum again (a must for anyone visiting Bulawayo! ), and had a nice browse around the exhibits. The place looks better each time we visit, under Dave Putnam's guidance. The attendance at the Museum is on the increase, partly through extra marketing and partly it seems by word of mouth from other visitors. 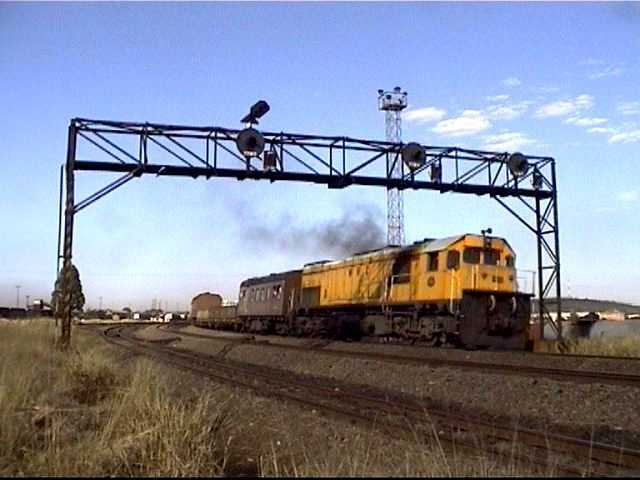 In the afternoon we visited Westgate Yard, Kelvin Yard, Mpopoma Yard, Belmont and various other places looking for Garratts at work with no luck. In despair we visited the diesel depot instead. I couldn't believe the size of the depot area, and the massive workshop sheds there. 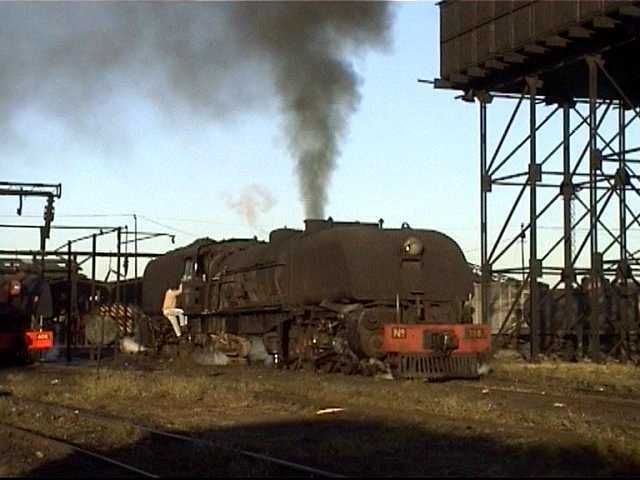 The whole place was virtually empty, with a group of diesels (mainly DE10A's) standing at the east end. 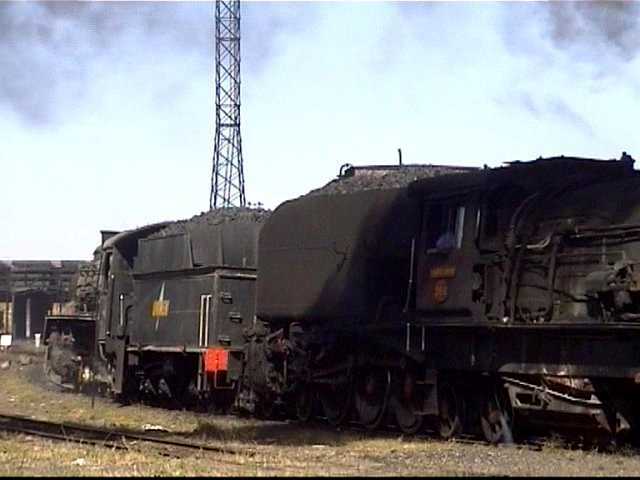 Poking out of one of the sheds was the nose of a diesel that looked similar to a DE10, but had a 2xxx series number - is this a DE11? We did a bit of night photography at the steam shed, but with half of the shed lighting not working, and none of the loco lights it was a bit difficult to get a good shot. None of these Garratts work after sunset any more, because they have no cab lighting either. 406's turbo generator was running, so I climbed into the cab to switch on the headlight (this loco was the only one with a globe), but the switch box was hanging by its wires, half of which were pulled out anyway, so we made do with our flashes and the available lighting. After once again being treated to Dave and Diane Putnam's hospitality, we headed to the shed Sunday morning for some more shots. 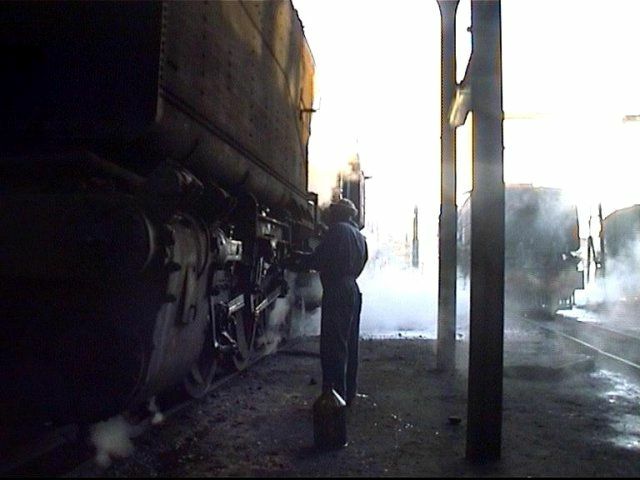 Again we had clear and cool weather, and we got some great shed scenes on film. One of the 15A bunkers was leaking so badly that it quickly made a pool between the lines, which gave lovely reflections of the next 15A glinting in the sunrise. 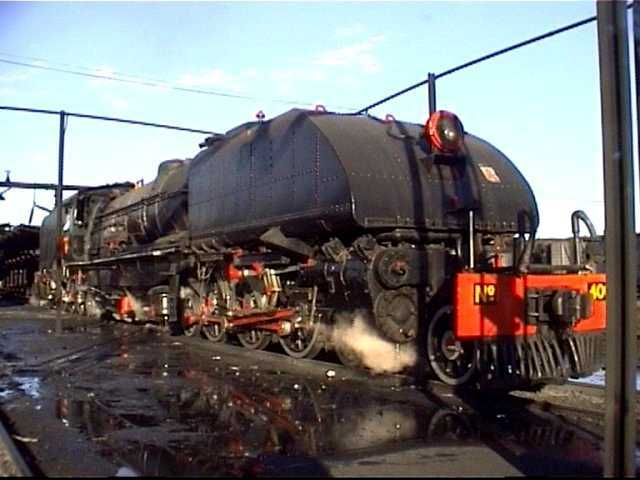 16A 610 was not in steam, but 16A 611 had been lit up overnight and was active. The shed foreman informed us that the 19th was due to take a load to Cement on its delivery run, which we greeted with enthusiasm. It was due off-shed at 6:25am. It hadn't moved by 7:30am, so we wandered out to the station yard entrance. I scaled the light gantry there part of the way to shoot the Rovos Rail train arriving behind a DE10A, and climbed all the way to the top to snap some "aerial" shots of the station and steam shed. The tower swayed so much I was glad to retreat to earth again! A couple more Garratts moved off shed, then the Harare train departed (new blue consist), also behind a DE10A in the standard NRZ yellow livery. This train did have a diner included, identifiable by a broad diagonal yellow stripe in the middle. 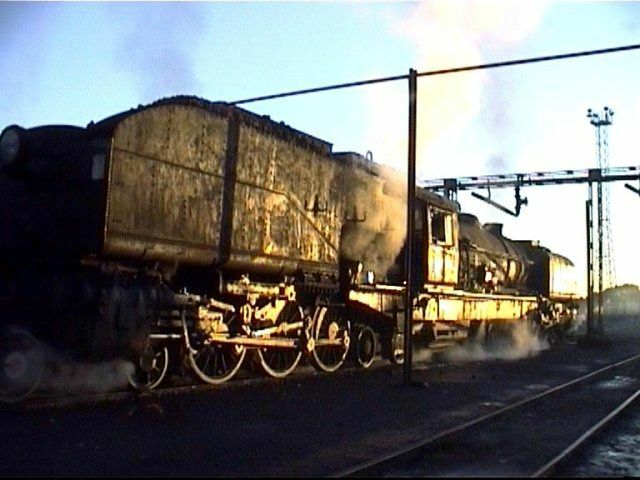 After 8:00am we headed back to the shed, where 15A 386 had coupled onto the 19. The 15A crew told us that they would be taking the 19 plus a load to Cement. That was even better - a double header! Fitters were still busy bashing something in the 19's cab with a piece metal pipe, and at one point they managed to get the tender light to come on (!). The 15A and 19 then set off for Westgate yard, so we followed. 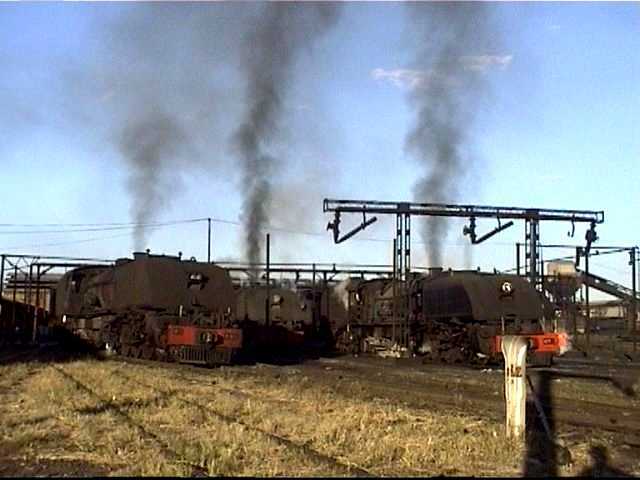 Whilst the 15A and 19 were standing at Westgate,16A 611 appeared from New Grain yard, and another 15A appeared with a rake of wagons from Belmont at the same time. 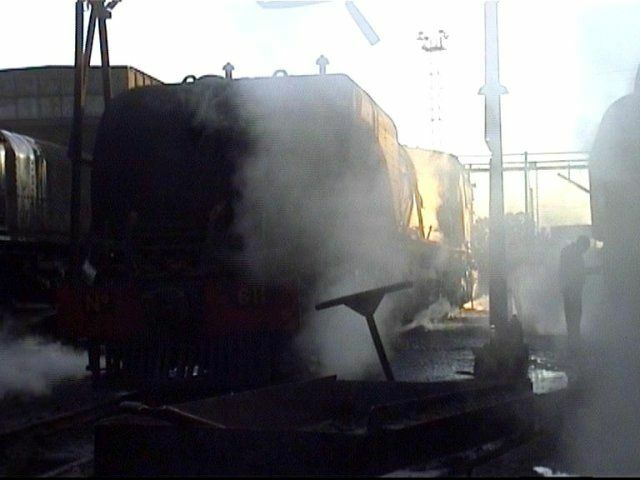 It was quite nice to be surrounded by steam locos at work! The 16A disappeared at a fast thrash towards Mpopoma, and the other 15A hustled back towards Belmont with some extra wagons. Meanwhile the yard foreman at Westgate told us that a diesel is on the way back from Cement to collect the 19 and the load. 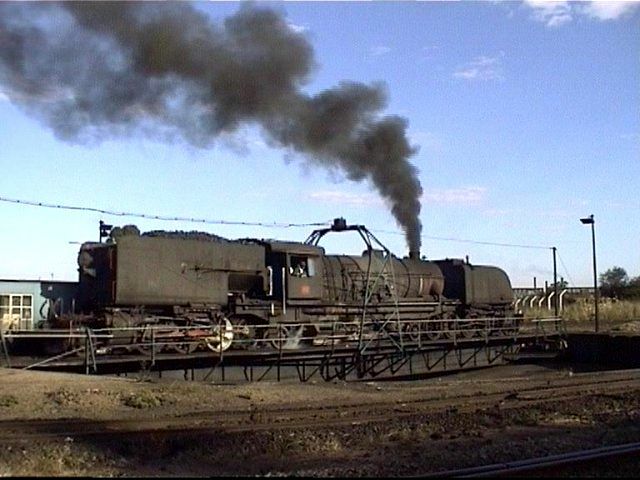 The 19 was duly shunted 2 wagons back into the load by the 15A, then left to await the diesel. It would arrive "sometime today", which could as easily mean "maybe tomorrow or the next day" based on previous time estimates! We decided to leave it at that and go. 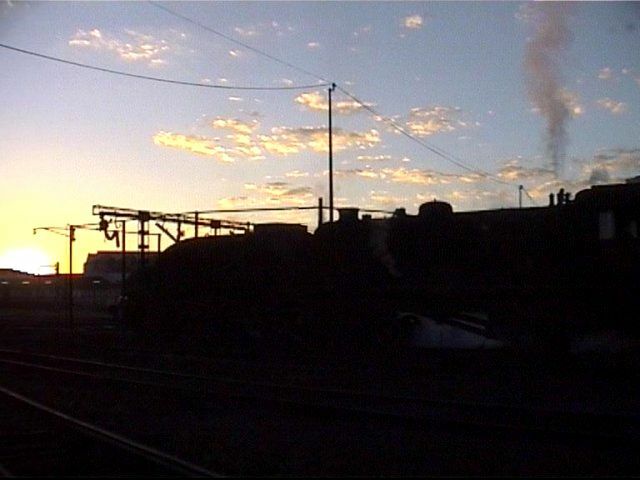 A last shot of the Rovos train turning on the balloon, then we hit the road. It appears that the Colleen Bawn to West Nicholson section of the BRR has been completed, with the exception of the former West Nic station yard and beyond. The roadbed crosses the main road and carries on out of sight down the valley. 20 km south of West Nic, the rails had been placed loose on the formation. 5km further south the sleepers were in place and the rail laid. 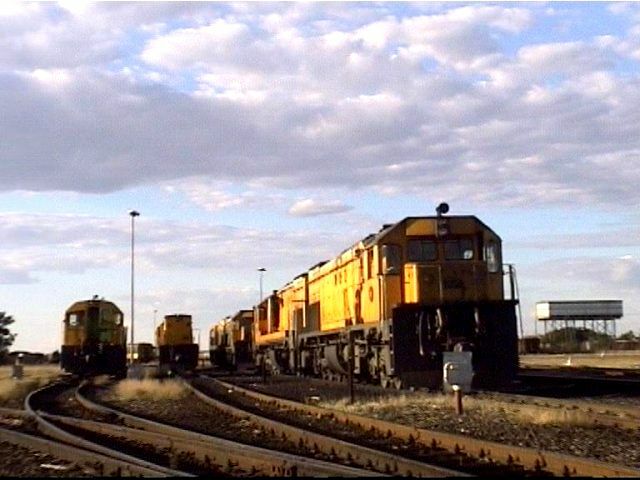 Spoornet diesels 33-218 and 33-219 (both low nose and in orange livery), were idling on a sleeper train near the work site, as the crews were busy laying sleepers (do any of the33-200's still have high noses?). The line had been ballasted to a point 5km further south. This brings the railheads to around 30 km apart, with the earthworks complete as far as we could see. We were told that the line will open in July some time, which would seem realistic. The section Beitbridge -West Nic is fairly flat, there don't seem to be many sustained grades (that we could see, anyway), but the original line from West Nic - Heany Junction has some killer hills. Parts of that section have been reballasted (not sure if the rail has been upgraded), but the diesels are really going to work with the loads on that section! The new section also some really scenic spots, which will make for some great shots once regular traffic begins. Maybe someone will also run a steam special on the line.